Whether it’s a sport or a hobby or simply an absurd excuse for the journey is the destination, man, “highpointing” (its practitioners spell it as a single compound noun) is the pursuit of reaching the highest altitude spot in each of the U.S. states, amassing these achieved peaks like collector’s cards. 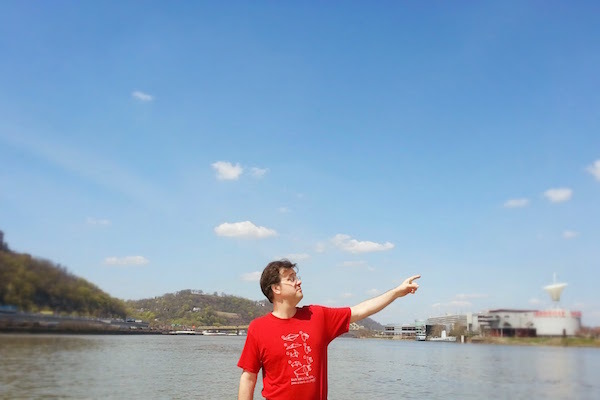 Ben Blanchard is a Pittsburgh highpointer. Ben explains that he got into highpointing naively. Years ago, he stumbled across a road sign directing motorists to the highest point in Maine, Mount Katahdin (alt: 5,280 feet). After making his way up and down from the mountain, Ben decided it would be a fun way to let kismet be his travel agent and kept after further highpoints. It turns out Ben is not alone and highpointing is a real thing. Web sites like highpointers.org and peakbagger.com provide both statistics and community information. Ben has currently visited thirteen state and two city highpoints. Next on the list is a New England swing to include New York, New Hampshire, Vermont, and a return trip to Maine. 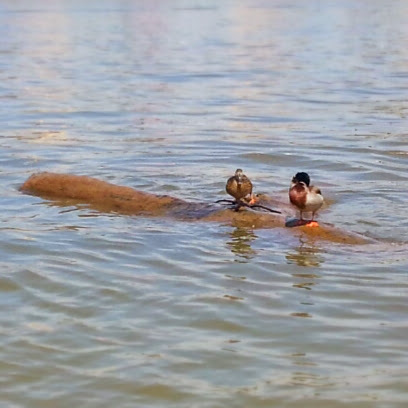 These ducks technically started lower than us, but we didn’t see them make it to the top. As no two states are the same, no two highpoints are either. Highest points are as diverse as a Philadelphia suburb (Ebright Azimuth, Delaware) or the upper edge of an inclined plane (“Mount” Sunflower, Kansas) to true mountain peaks like Mt. Whitney (California) or Mt. Elbert (Colorado). Every American highpointer’s ultimate goal is Denali (Mt. McKinley) in Alaska. For The Orbit, I proposed scaling the highpoint for the City of Pittsburgh. Apparently highpointers look down on city/county highpoints in favor of states/countries, but it sounded interesting to me. I laid out a goal that we would travel from low to high, and make the journey on bicycle. Historically, Pittsburgh’s low point was Donzi’s in the Strip. But with that floating meat-rounder barge sadly no longer operating, its bass cabinets and Jello shot molds long dormant, we had to settle for river level (alt. 719 feet) as the accepted lowest altitude. And, just to get real symbolic, we met at “The Point,” the tip of Point State Park, where the three rivers meet. Our destination was the top of Montana Street (alt. 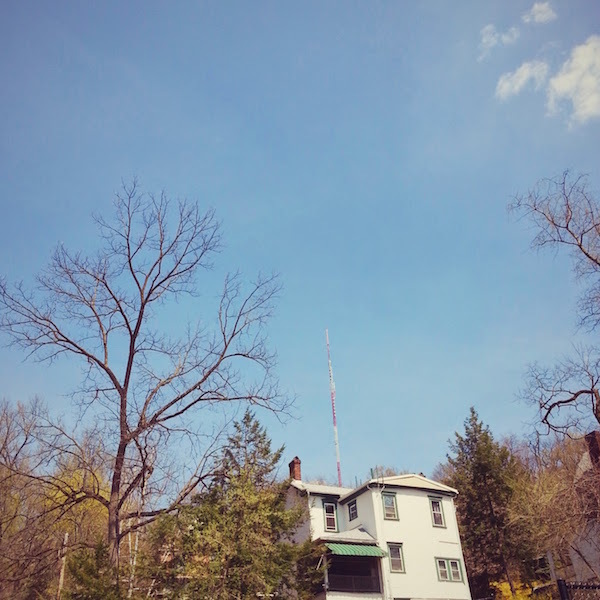 1345 feet), KDKA’s giant broadcasting tower standing as a (literal) beacon for us head toward. 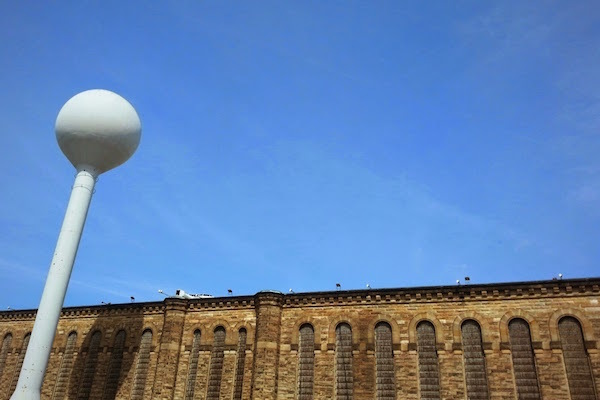 The route would take us down the Ohio River bicycle trail, past the old Western State Penitentiary, through the neighborhood of Wood’s Run, up along the northern edge of Riverview Park, and finally up to the peak in Perry North. The one block assent of Montana Street proved the most difficult cycling of the trip, it being one of those Pittsburgh hills so steep the rider is forced to lean over the handlebars just to avoid the bike flipping backwards on itself, but we made it. 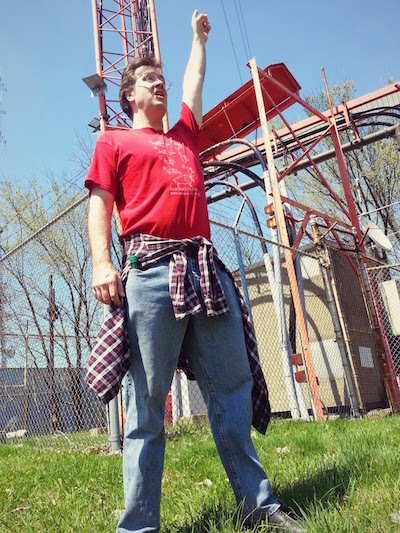 I had been on one previous (city) highpoint in Washington, D.C. (Ft. Reno Park) and similar to that one, the actual peak is off-limits to the public. Ours has a high chain-link fence surrounding a large water reservoir and processing facility. We were able to walk the full circumference of the facility. There’s no benchmark to get a photo by, nor is there much of a view–you’re surrounded by trees on all sides. 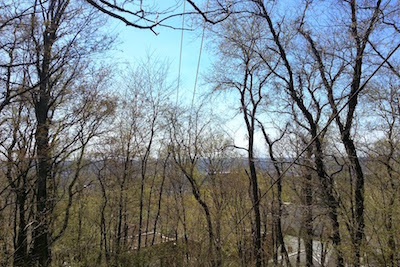 But in the early Spring, we still got some nice glimpses of the observatory in Riverview Park and the top of Downtown Pittsburgh’s skyline, looking like it grew naturally out of the woodlands. Our stats: we climbed 626 vertical feet over around 6.5 miles, about half of that along the river to get from town to Wood’s Run. It took us around 45 minutes going up on bicycles; the return trip is very short as it is literally all down hill. A bar called Rumerz in Wood’s Run [Ben: Have you heard anything about it? Me: Don’t believe everything you hear. Ben: What are you talk…oh.] provided few beer options, but a nice outdoor deck, built Pittsburgh grotto-style, right up against a rock wall. Victory: point high for a highpoint! A note to would-be bike-pointers: this blogger made the trip up just fine, but the rest of our party (ahem) needed to get off and push a couple times. It’s no big deal, though, if you’re in decent shape and have a full collection of low gears. The bigger deal (for me) was actually coming down the hill where my (under-performing) brakes were pushed pretty hard and I reached a semi terror state. If I’d had to actually come to a full stop anywhere, it would have been ugly.